Microsoft is expanding its horizons with its newly revealed Office 2010 software suite. The updated Office will be available in two separate formats: a traditional PC-based edition and a completely Web-based version. Both products are expected to be released in the first half of 2010. Here are answers to some common questions about the new Office 2010 and what you can expect from a consumer perspective. Will the PC-based Office 2010 and the Web-based Office 2010 be the same? No. The Web-based version of Office 2010, called Office Web apps, will include only Word, PowerPoint, Excel, and OneNote. The functionality in the programs will also be limited. What'll you be able to do with the Office 2010 Web apps? Microsoft's Office 2010 Web apps will give you full browser-based viewing and "lightweight" editing of any Word, PowerPoint, Excel, and OneNote files. The apps will allow for multiple people to edit the same files concurrently (a la Google Docs). Will I be able to save files online with the Office Web apps? You'll have the option of saving files online, although you will have to sign up for a free Windows Live Skydrive account to take advantage of the cloud-based storage. Will the Office 2010 Web apps be free? Yes. Personal consumers will be able to access the Office 2010 Web apps free of charge using a Windows Live ID. Why would I want to consider the PC-based Office 2010 instead of the Web apps? The Web apps will provide only basic functions of the four "core" Office programs. For anything more advanced, you'll still have to turn to the traditional PC-based version of Office. Will Office 2010 still have the Ribbon menu interface? Yes, although it's been updated from its Office 2007 debut. First, the Ribbon will now stretch across the entire Office suite of programs. The placement of commands has been tweaked to make common tasks easier to find, and -- unlike in Office 2007 -- you'll be able to customize the Ribbon to your own personal preferences by adding, deleting, and relocating menu options. 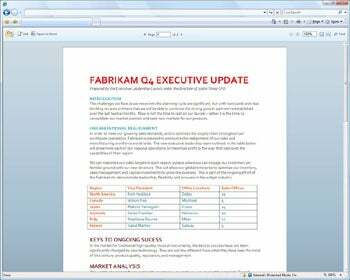 What's new in the Office 2010 PC version of Word? Some of the additions in Microsoft Word 2010 include a new Paste Preview option that allows you to preview the formatting of content before inserting it into your document; improved options for customizing text with effects and various styles; and the ability to insert screenshots into a document without exiting the Word program. You can also more easily edit images with an improved photo editing tool. What's new in Outlook in Office 2010? The updated Microsoft Outlook 2010 includes a Gmail-esque "Conversation View" that lets you group connected e-mails into single conservation entries; the ability to create macro-style shortcuts to simplify common tasks; direct access to your contacts list from your inbox; and the addition of on-demand translation tools. Microsoft Excel 2010 adds something called "Sparklines," described as "tiny charts that fit within a cell and give a visual trend summary alongside text data." It also boasts improved table handling, better charting performance, and more advanced methods for manipulating data. Any standout additions in PowerPoint? The most noteworthy additions to PowerPoint 2010 are related to video: You can now import videos from different formats and make edits right within Office -- and, for the first time, you can export your entire slideshow as a Windows Media file. PowerPoint 2010 also features an improved selection of slide transitions, including some three-dimensional options. Where can I find a detailed breakdown of all the programs' new features? Check out "Office 2010: A Complete Overview of What's New" for an app-by-app breakdown, or see "Visual Overview of Office 2010 Features" for an image-based tour of the new Office 2010.